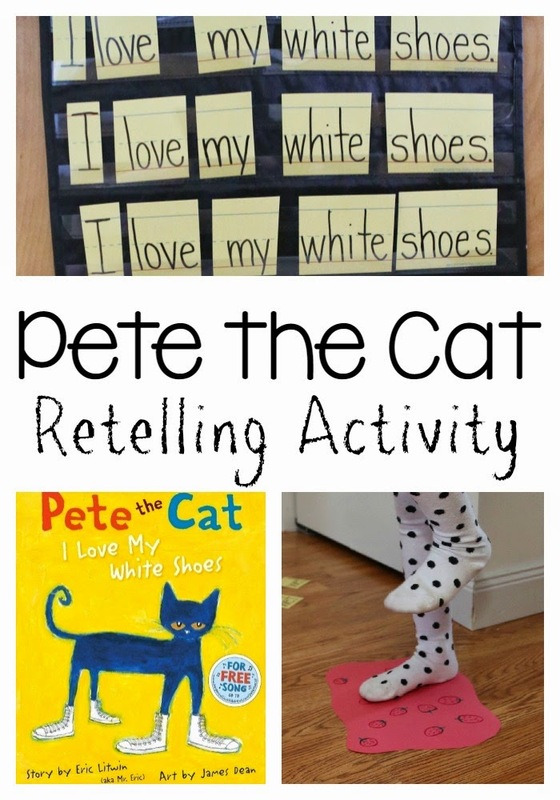 We loved retelling Pete the Cat I Love My White Shoes by Eric Litwin with our literacy and gross motor activity! 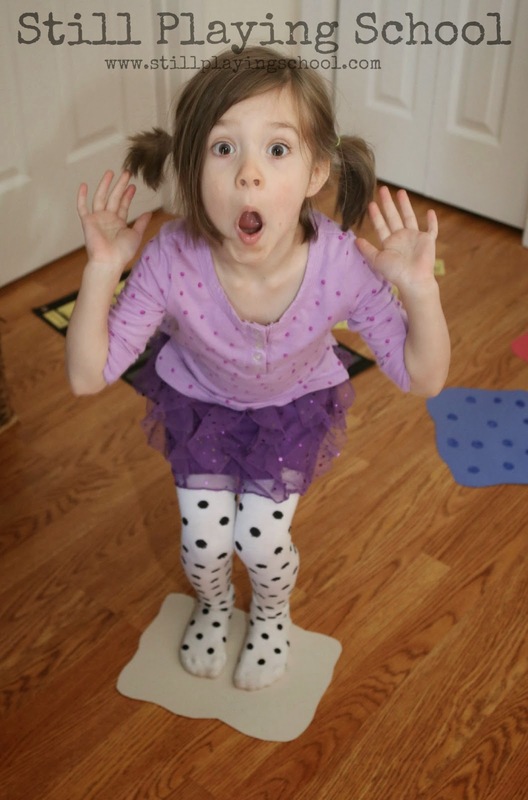 This book is just so catchy that kids want to read it again and again so we acted it out. Our favorite part about the Pete the Cat books by Eric Litwin are the catchy songs. In this story Pete sings about loving his shoes! I wrote the refrain on sentence strips then cut apart the individual words. 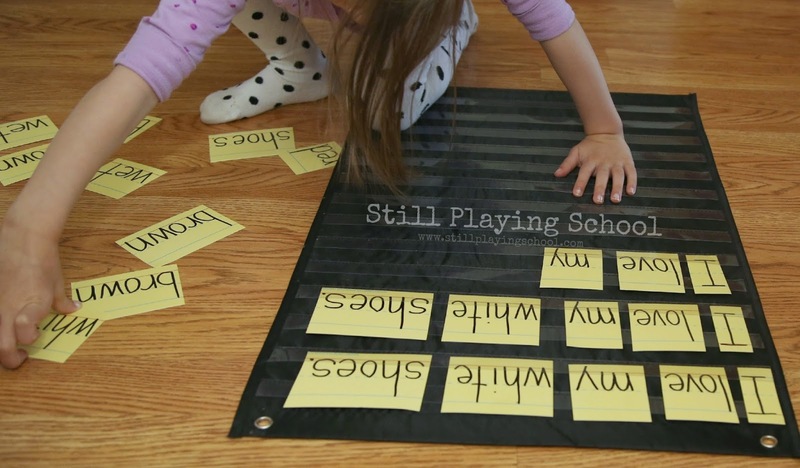 Our preschooler, who is an early reader, put the sentences of the song in order in our pocket chart which keeps her work in place instead of allowing it to slide all around the floor. We cut out and colored the different piles that Pete steps in his white shoes. Our preschooler E enjoyed helping me make these while her toddler brother was still napping! I read the story while E acted it out. First she stepped in the pile of strawberries. Oh, no, now her white shoes were red! She changed the lyrics of our song replacing the color words. We sang it again! "I love my red shoes..."
Uh, oh, she stepped in some blueberries! By this time toddler D was interested in our acting and joining in too. After each color change E was in charge of changing our sentences. So many early reading skills are occurring here. She is learning concepts of print, the one to one ratio of words, and word spacing as she reads. Oh, no, D stepped in the blueberries! He loves his blue shoes! He was also definitely taking in his sister's work! Finally E stepped in a bucket of water. Her shoes were white again but now they were all wet. 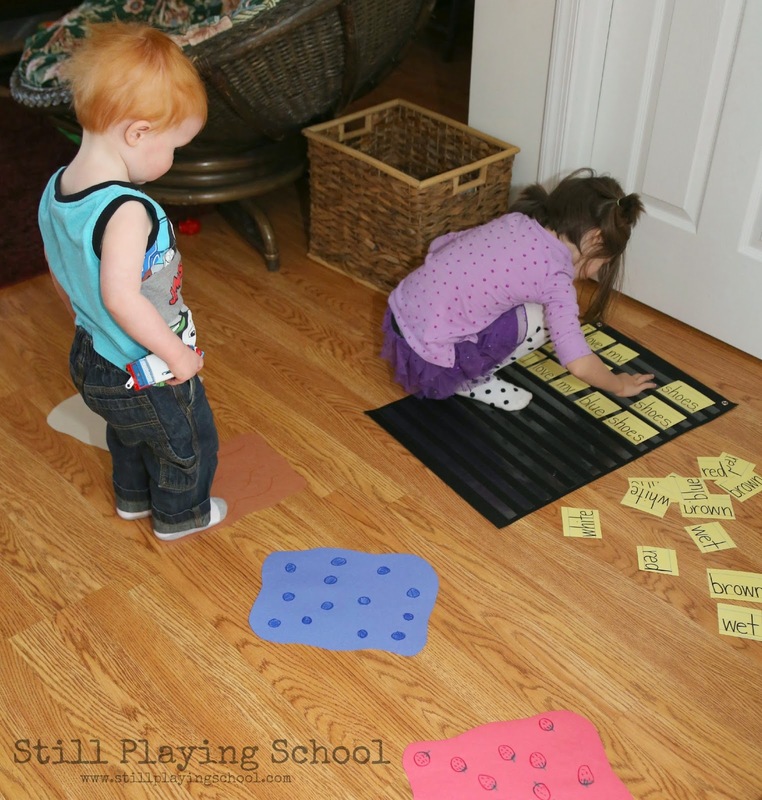 We left the pocket chart with the words up in our house for a homeschool preschool literacy center that E loves to revisit often! She can grab the colored puddles and act out the story again with her brother or independently any time she chooses! 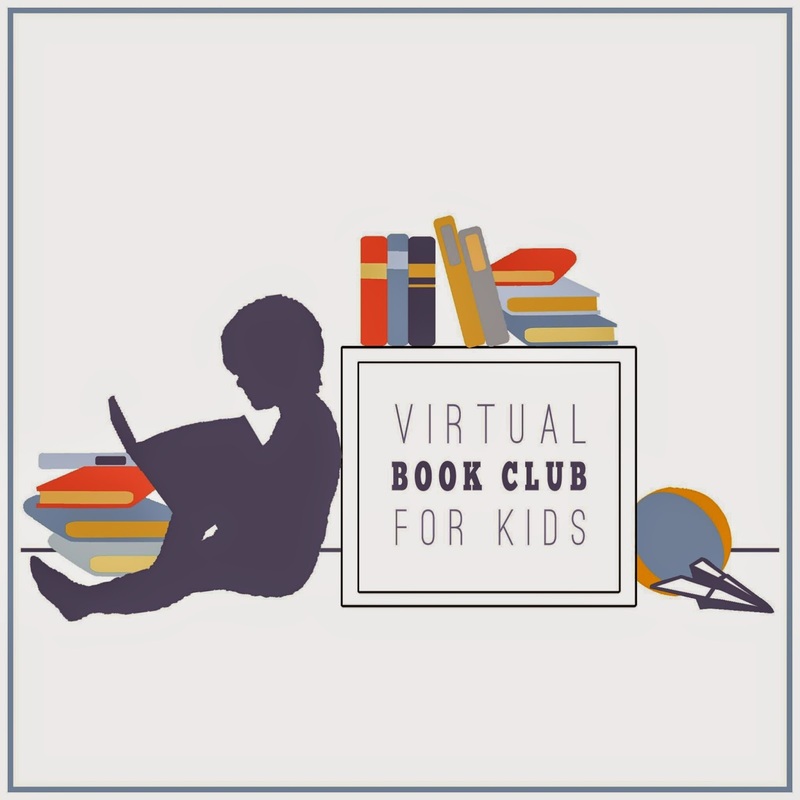 This post is part of our series with the Virtual Book Club for Kids. 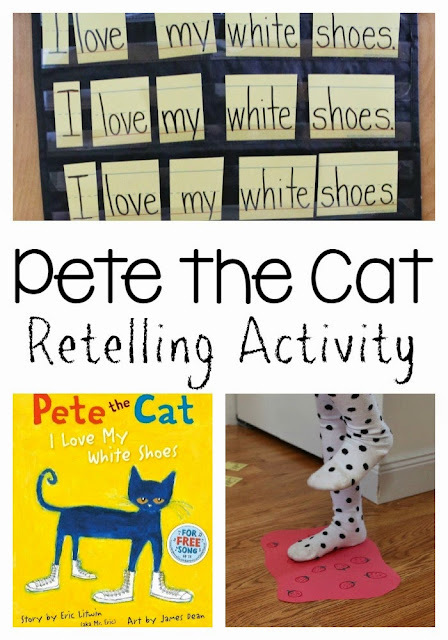 Several other amazing blogs are also bringing you ideas for activities based on Eric Litwin's books this month including Pete the Cat and His Four Groovy Buttons, I Love My White Shoes, and Rocking in My School Shoes. Join the Virtual Book Club for Kids Newsletter to receive great book activity ideas in you inbox!